Mr Albrecht, we take selfies, post comments, are constantly online and share our lives willingly with the general public. Are we living in a post-privacy world? I am convinced that the vast majority of people still want a private sphere in these digital times. Above all, they want to determine themselves when and what information about them is made accessible and to whom. It is legally and technically absolutely possible to ensure privacy and data protection in the networked world. You just need the right rules. But our understanding of privacy has definitely changed. The strict demarcation between intimate, domestic and public spheres is no longer there. Throughout the decades and centuries the concept of privacy has changed over and over again, not just since digitalisation. Nevertheless, even today we still differentiate between what I tell my grandmother, my employer, my little sister and my health insurance company? There are still these different spheres. And many users are thinking more carefully about what they want to post on the Internet. These users are looking for privacy-friendly options – one could also say: privacy-enhancing options. Have you noticed a new development then over the last few years, a growing awareness among the people of Europe? Has the desire for privacy become stronger again? Absolutely! This has most definitely been observed. When Facebook introduced its Timeline option a few years ago, making it possible for users to trace back their own remarks over the years, that frightened many people. They were not aware of the public exposure at all. These days, many users are more cautious, because they have realised that Facebook is not the same as within their own four walls at home. Anti-tracking extensions for browsers and encrypted communication services are also being used more frequently. Unfortunately, a minimisation of data is not always possible. Especially on their smartphones, users often accept the fact that apps are intercepting and capturing a lot of data. Are we still taking things too easily? The fact that in general we have become more sensitive in the areas of privacy and data protection does not automatically mean that we are prepared for digitalisation. As a society, we are lagging far behind all the new technological developments. It is a common task we all have to face up to. Laws alone will not protect us. We have to learn more about it and get fit for this new world for these new developments wait for no man. How will we deal, for example, with driverless cars which might permanently be filming us? Or with artificially-intelligent websites that talk to us and record our dialogues? There was also once a time when you could not buy Fair Trade products in the supermarket. If you wanted coffee, you had to take what was on the shelf. Only gradually did alternative options begin to emerge. These alternatives will also start appearing in the digital realm. Unfortunately, at the moment we are still in a situation in which we are heavily dependent on certain platforms or operating systems. Politics must break these monopolies and encourage alternative providers. Why is the private sphere so important for democracy? Freedom of communication and expression must be guaranteed. Democratic discourse suffers when people are continually afraid that their private utterances will later be interpreted to their detriment. For example, if they apply for a loan at the bank or for a job. This kind of discrimination is already taking place. Promotional offers are already being tailored to what a user has already looked for or purchased in the past. Over the past few years, you have played a key role in drawing up the new European data protection regulations. What is the current political situation? We passed the regulations by a large majority in both legislative chambers in spring 2016, both in the European Parliament and the Council of Ministers. They will apply in all EU countries from May 2018 onwards. They will in fact be binding for all companies that are entering the European market – including providers from Silicon Valley or China. All these companies must adhere to the European rules on data protection, otherwise horrendous penalties will be imposed. For the sake of simplicity, this has already led to many companies applying the strict European regulations for their entire international business. What then are the main innovations for the people of Europe? The most important thing is that data protection must be taken seriously by companies – so that, in the end, it can be consistently enforced. In addition, the individual will have a lot more rights. Entrepreneurs will have to inform users exactly what will be done with their data. And in a way that everybody can understand! Not in longwinded declarations that only lawyers can understand. Another possibility might be the introduction of a system with simple, standardised symbols. A private sphere despite total networking – what does your vision look like? What I would like is for everybody to be able to deal with their data in everyday life in the same self-assured way we adopt, for example, when we go shopping. Here, too, we constantly have to make decisions: should I choose this or that product, should I pay cash or by card, should I avoid or prefer certain shops? At some point we should also be able to move through digital space in a similar way – with the same confidence and self-determination. 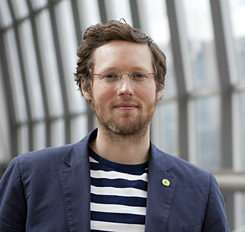 Jan Philipp Albrecht | Photo (detail): © Fritz Schumann Jan Philipp Albrecht, born in 1982, has been a member of the European Parliament for the German Green party since 2009. He is Deputy Chairman of the Committee on Internal Affairs and Justice and is a substitute member of the Committee on the Internal Market and Consumer Protection. In addition, Jan Philipp Albrecht was the European Parliament’s Chief Negotiator for the new EU data protection regulations. Astrid Herbold is a free-lance journalist who writes for publications such as “Der Tagesspiegel” and “Zeit Online”. Copyright: Text: Goethe-Institut, Astrid Herbold. This work is licensed under a Creative Commons Attribution – Share Alike 3.0 Germany license.